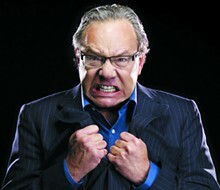 Lewis Black, the angriest man in America, returns to St. Louis for his "The Joke's on US Tour." The self-proclaimed socialist has an abiding dislike for stupidity, selfishness and mendacity, and that's practically the family motto for the current American president (the opposition party hasn't done a whole lot to distinguish itself, either). As a comedian, Black mines the horrors of such cads for bitter laughs, but this regime may be too much of a dumb thing. Rest assured, Black will break down the modern state of affairs with all the fury of someone who expects better but knows he'll never get it. Black takes the stage at 8 p.m. Friday, March 22, at the Stifel Theatre (1400 Market Street; www.stifeltheatre.com). Tickets are $36.50 to $72.